There are few things in life better than large, hardcover, richly-illustrated children’s books. As a child, these were the books I most often pulled from the library shelves. Beautiful visuals invite the eye to stay for a while, while skilled writing engages and challenges the mind. Even today, I sheepishly browse the children’s sections of libraries and bookstores, in love with nearly everything in sight. 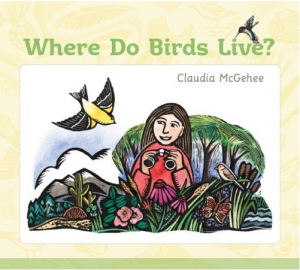 In Where Do Birds Live?, Claudia McGehee works as both writer and illustrator to inform and enchant us about the habitats of American birds. This large, hardcover book has full, two-page spreads dedicated to each bird featured. The left pages include: illustrations of the bird itself, basic information about its traits, habitat, life challenges, and how humans can help keep the particular bird from becoming endangered. The right pages feature a full page illustration of the bird’s habitat and neighbors. I must add that every illustration in the book is a scratchboard piece; a difficult medium to work with, but gorgeously performed by Claudia McGehee. The birds represented in the book are limited to those that live in the United States. Common varieties such as hummingbirds, bluebirds, gulls, and ravens are presented, as well as less commonly noted birds such as tanagers, flycatchers, roadrunners, and oystercatchers. I was inspired to do research on my own after reading this book; I wanted to listen to bobolink prairie birds sing and see photos of the Pacific rain forest. Now I’m considering visiting that area someday, if possible. People of all ages would appreciate and benefit from this book. The writing is informative and accessible and the illustrations were a labor of love. The entire book is inviting and engaging, with interesting tidbits on bird behavior and helpful advice on how humans can conserve bird habitats for years to come.